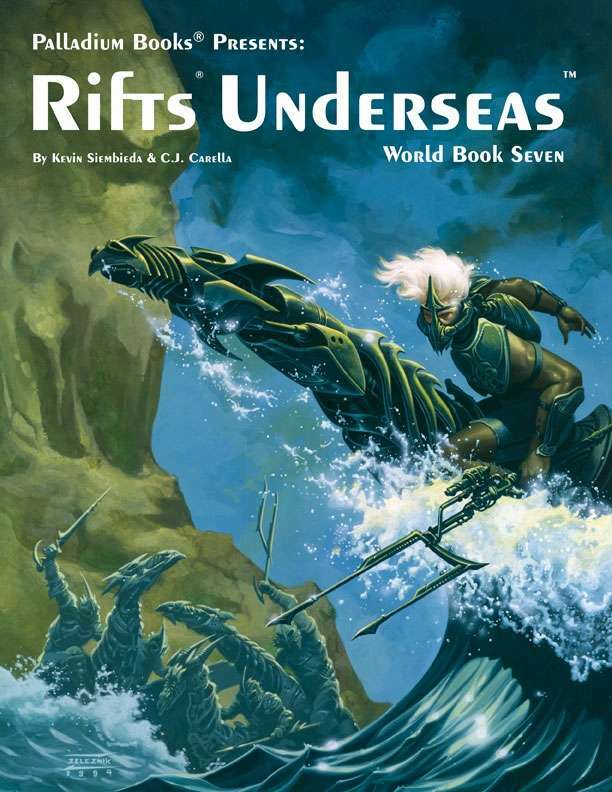 Rifts® Underseas is a fabulous world as unique and expansive as any Rifts® Dimension Book™! Gamers may be surprised at the scope of characters, abilities and adventures available to them, both undersea and on dry land. Also good for campaigns set in the Great Lakes, along the Mississippi River and in the Gulf of Mexico, the Amazon or the Mediterranean Sea. 10 O.C.C.s like the Whale Singer, Ocean Wizard and Sea Druid. 20 aquatic R.C.C.s like the Naut Y’ll, Sea Titan and Amphib. Over 40 Ocean Magic spells, 20 Whale Songs and Dolphin Magic. Dolphins and whales, intelligent creatures sensitive to magic. Bionics, power armor, robots, weaponry, aircraft, subs & ships. Tritonia, a floating city that has survived the Great Cataclysm. Atlantis underseas and the Horune Pirates along with their massive Dream Ships. The New Navy, descendants of the old US Navy who patrol the sea. The USS Ticonderoga submersible aircraft carrier and other incredible Golden Age technology in the hands of the New Navy. Info on the NGR Navy & Triax™ and their amazing underwater war machines. Gene-Splicer™ creations, mutants, Dead Pools, & more. Written by Kevin Siembieda & C.J. Carella.